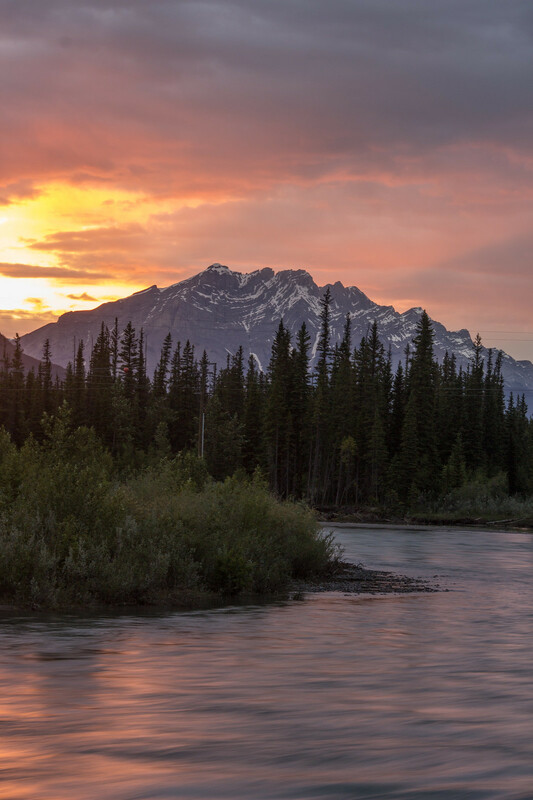 When we were in Canada, one of our goals was to see an amazing sunset, and Canmore finally provided us with one from the Bow River Loop trail. We tried hard to chase sunsets but the sky was just not in our favour, over and over again. The sky would either go a darker shade of blue, completely cloud over, or it would rain torrentially. On our first day in Canmore, we discovered the Bow River Loop, a 20-minute flat walk around the Bow River on the edge of town. As we were sat in our hotel room one evening, we spotted colour creeping into the sky and dashed out to the car and down to the trail. 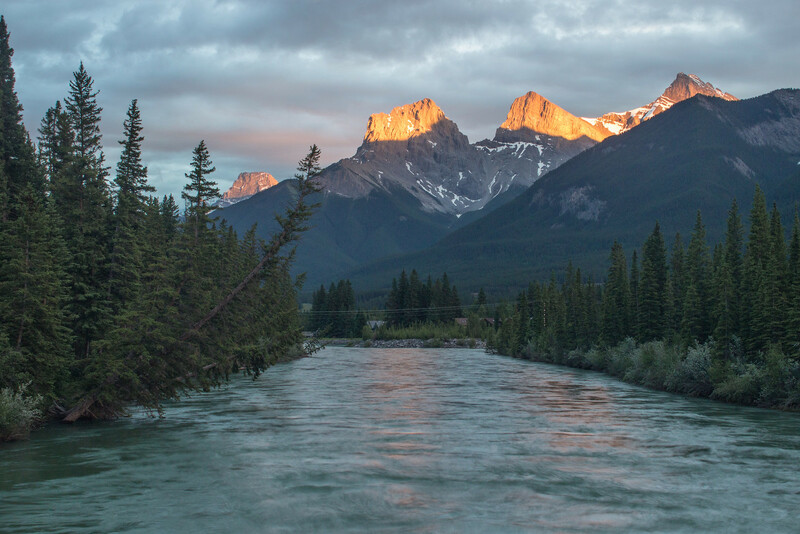 Golden light bathed the mountains and forests surrounding the town and we almost ran down to Canmore Engine Bridge to set up the camera. 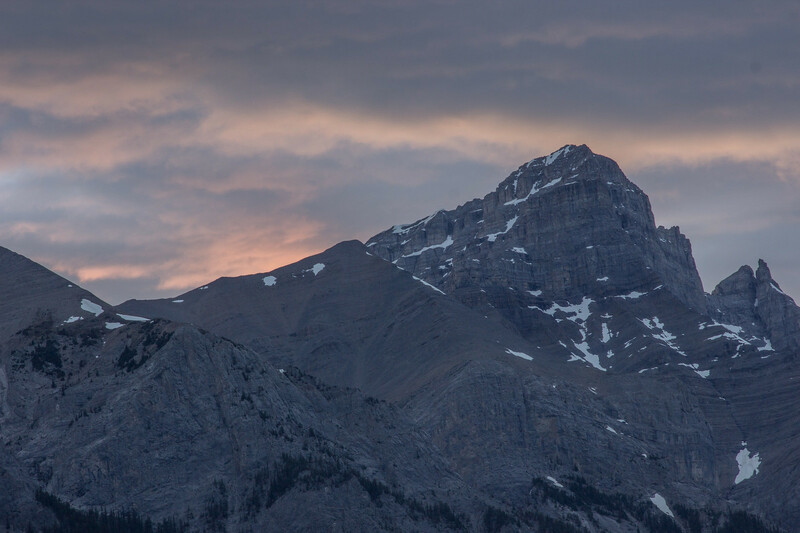 It wasn’t long until we were treated to a pink, red, and orange display lighting up Mount Rundle and Cascade Mountain. I loved the way streams of light seemed to shoot out of the top of the mountain and paint patterns in the sky. We stood there for a while, taking photos and trying to take in the awe-inspiring sunset, and were pleasantly surprised by the amount of people who started conversations with us. Considering both of us hate small talk, we loved the way people talk to each other on the street. Everyone has heard the stereotype that Canadians are friendly, and it was true of the majority of Canadians we spoke to. Canadian hospitality has got to rival Southern hospitality because we felt welcomed and at home everywhere we went. 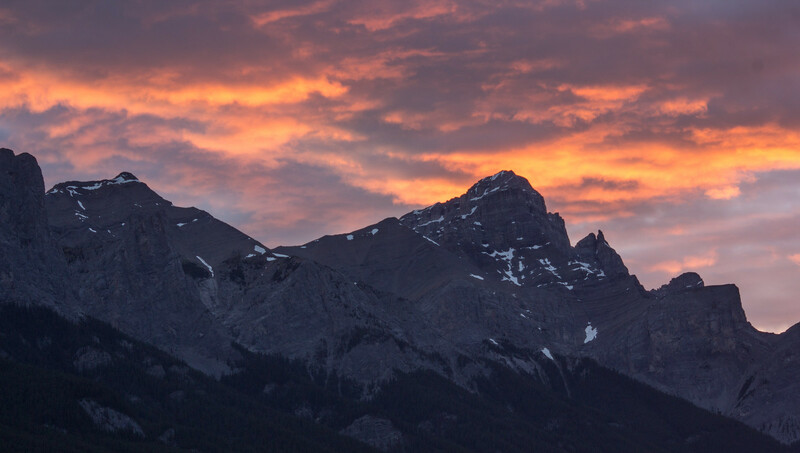 Canmore is one of our favourite places in Canada. The locals say that Banff is where you go to visit and Canmore is where you live. 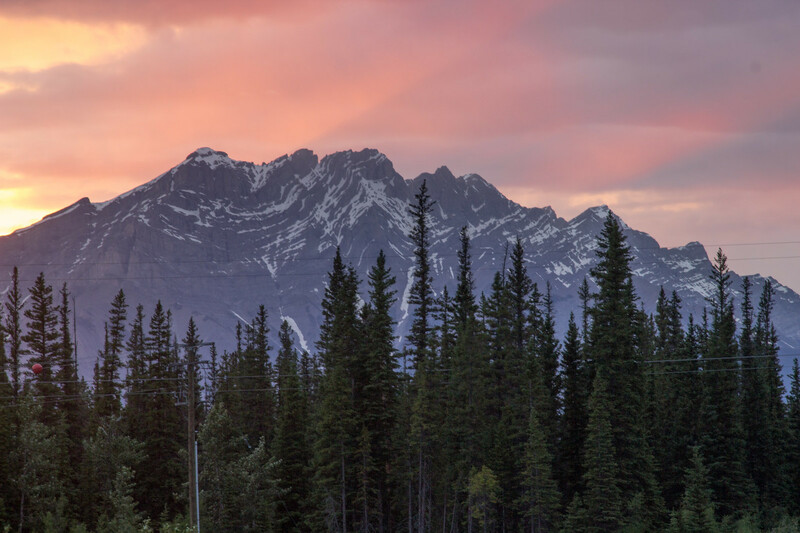 It’s a fairly quiet little town, about 20 minutes from Banff, on the Bow River with plenty activities to choose from, such as; hiking, kayaking, stand up kayaking, climbing, snowsports, and more. 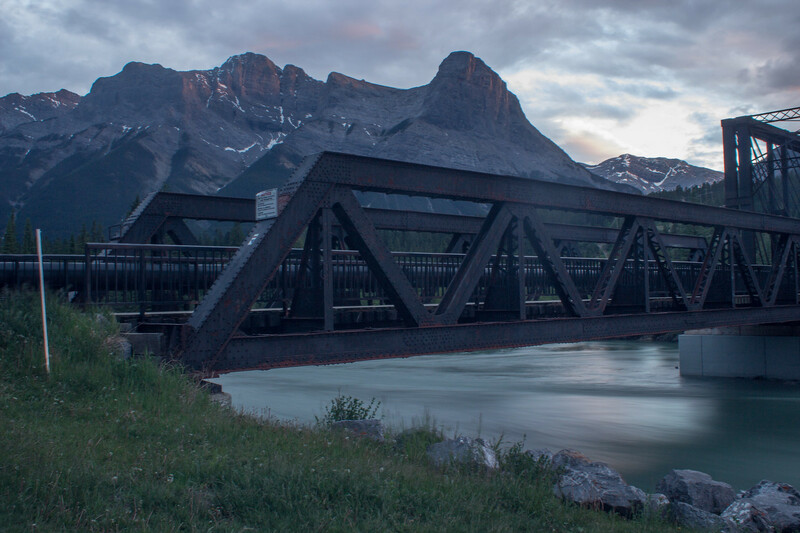 If you’re ever in the Canmore or Banff area, it is well worth taking a stroll around the Bow River Loop at sunset. The trail in general is well worth a visit in general, whether you’ve got half an hour spare to take in some spectacular views, a few hours, or the whole day; the Bow River Loop connects to other walking and cycling trails, so you aren’t going to be short of things to do. Where’s the best place you’ve watched the sun set?